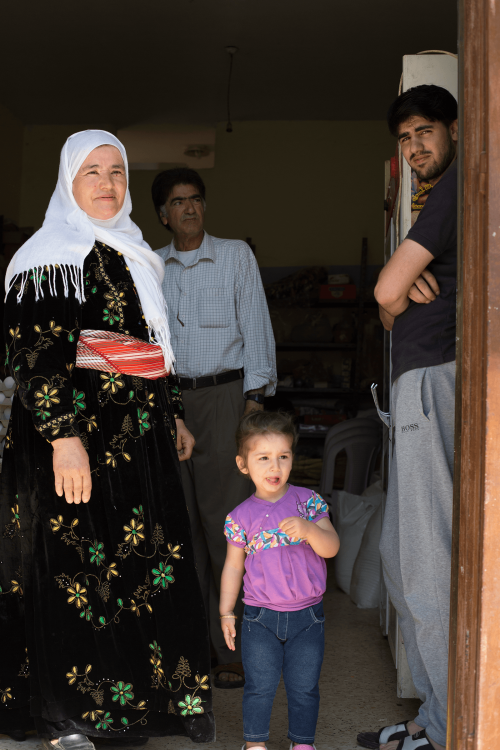 Olive farmer Myasar has had to step into the role of provider for her family and in doing so has discovered her aptitude for business. She is an olive farmer. And a soap-maker. And a community leader. And no stranger to hard work. 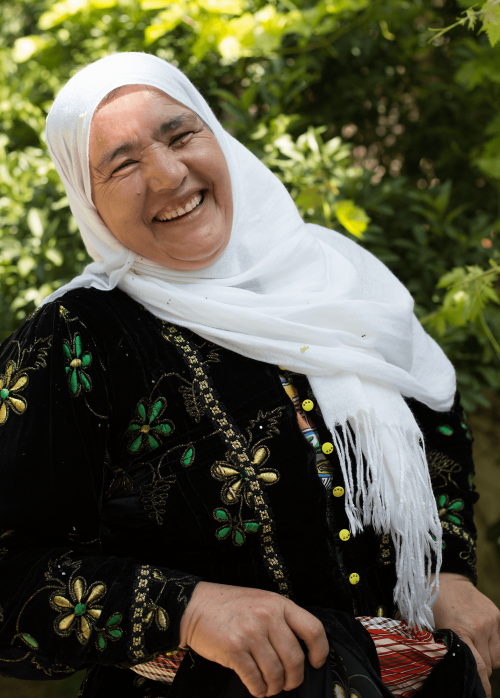 Myasar does what’s typical of a Palestinian housewife with children: She assigns one of her younger daughters to clean grape leaves that will be stuffed with rice, she cleans olives from the family farm to serve guests, and she makes sure to sweep the front porch of her house. She is also among the 21.5 percent of women who work in the agricultural sector in the West Bank, according to Palestinian Central Bureau of Statistics (PCBS) 2013 data. She is part of the 17.4 percent of women who participate in the workforce, which the UN says is much lower than the rest of the Arab world, where the number of women in the labor force is usually around a quarter of the population. Myasar is also in an even smaller class. Eleven percent of women in agriculture are self-employed, compared to nearly 20 percent of men in agriculture. While the numbers of women in the agriculture business might be as modest as Myasar’s backyard farm, she’s found a way to support her family with this and her at-home businesses. Myasar’s agriculture business, especially olive oil, has blossomed. Unlike many other farmers, she’s able to live off what she earns from her extra virgin oil. Since the beginning of this year through June, she had earned 30,000 shekels, which totals almost $8,000. That’s 58 percent more than the average Palestinian worker would have made by then, according to the most recent wage averages reported by the PCBS. Myasar has been able to flourish because of her participation in Olive Oil Without Borders (OOWB). 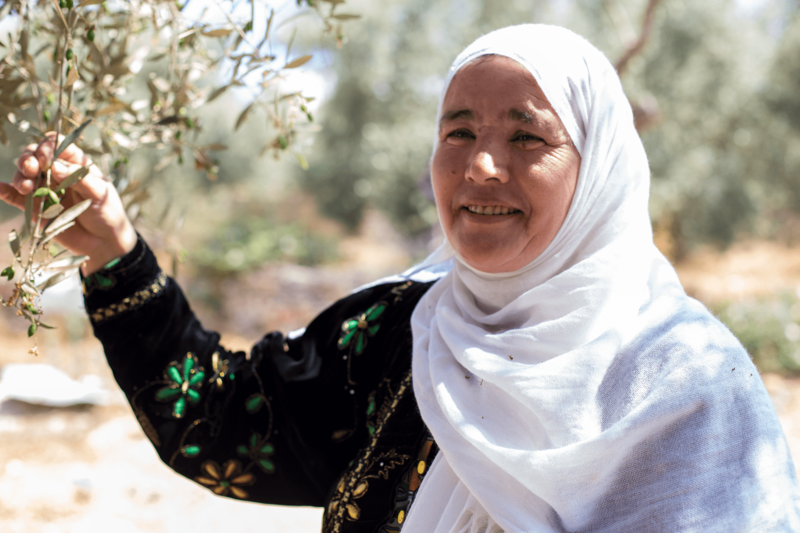 Since its launch in 2011, OOWB has cross-trained over 3,000 Palestinian and Israeli farmers. The purpose of the program is to connect olive oil farmers on both sides of the border to learn best practices from one another. Myasar heard about OOWB after attending a local training session where the Near East Foundation was teaching farmers how to make organic fertilizer. Myasar has participated in ten trainings in Israel since joining OOWB, and she has earned a certification in olive oil tasting. The quality of her oil has improved, gaining the attention of Canaan Fair Trade, a Palestinian-led company that trades olive oil from small villages like Myasar’s and ships it to the United States, United Arab Emirates and other parts of the world. Myasar estimates that her land produces about 120 to 150 tanks of oil per year. Each tank weights slightly over 35 pounds. Because her 13 acres of farmland are bountiful, Myasar keeps family members and five employees busy in the fields every day. She pays her employees 100 shekels per day, more than the 89 shekels that the average agriculture worker made in 2013, according to the PSBS. She also provides her workers with meals when they break and offers them crops like her olives in addition to what she prepares for them. Myasar has known all her employees since they were children, she said. She said another OOWB farmer, one she considers the best in West Bank, pays his employees 25 shekels less than she does. “It is for the honor and reputation for the woman at the top” that she pays more, she says. While Myasar’s olive oil farming is doing well, she has found other ways to generate income for her family as the main provider. The first level of her home, which was designed by her husband and his brother, hosts a shop that she started in 1999 to sell her soap products and other goods. The second level is her family’s living space, where she treats guests to olives from her farm and her homemade cheese in her living room. Just around the corner, her kitchen serves as a place for her two teenage daughters to pitch in with household chores as Myasar multitasks between making soap and cheese. 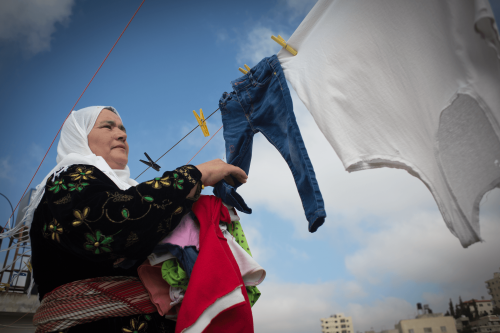 Her husband, Mahmoud, 64, has a damaged cornea as the result of diabetes. About 10 years ago, he noticed that his vision was deteriorating, so he saw a doctor. “I didn’t know I had diabetes until it affected my eyes,” he said. His vision has improved and his blood sugar levels are now normal, but without glasses, everything is still quite blurry. “I see just enough to see (Myasar’s) beauty,” he said, smiling at her. Years ago, Mahmoud was studying in Italy to become a general practitioner. He’s still fluent in Italian, but that is about all that’s left of his education there. With the First Intifada, he was blocked from returning to Italy, with only two years left to complete his studies. Seeking higher education has been what most of her children have done. Myasar herself has a two-year degree in psychology and she was a teacher in Saudi Arabia for a time before settling in the West Bank. Out of her eight children, six either have bachelor’s degrees or are in the process of receiving one. Her 23-year-old son, Hilal, is studying civil engineering at Palestine Polytechnic University in Hebron, which is about three hours away from home. He said he wants to become a professor at the university, although farming has always been a part of his life. Myasar smiled at her son, both with pride and amusement. 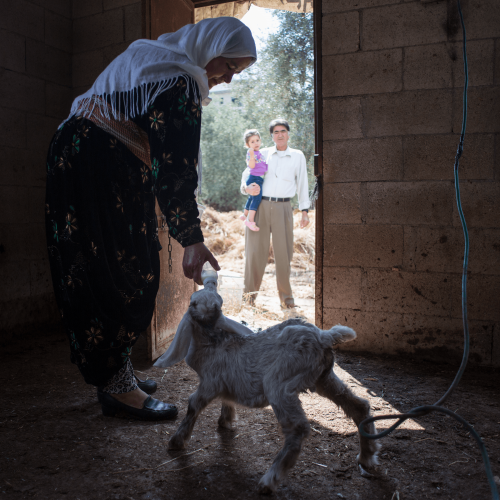 While Hilal might not work on the land after he receives his degree, the family land is sure to remain in good care at the hands of her 16-year-old daughter Karmen and her 13-year-old daughter Shahed.